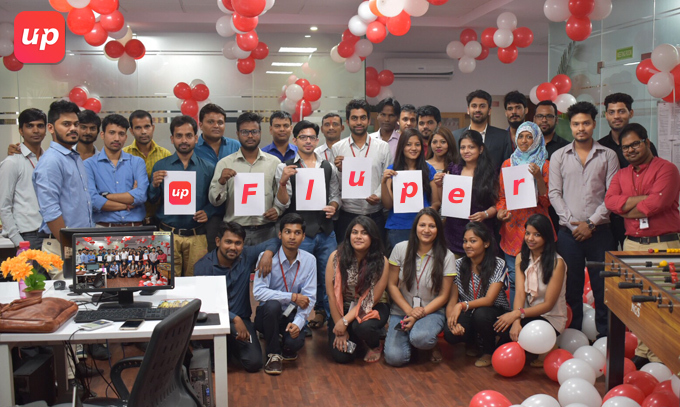 Fluper Ltd., one of the leading mobile app & web design and development company that is known for its most promising and leading services, is glad to announce its completion of six months at its New Development Base at Noida, Uttar Pradesh. The journey that begun years ago has now been going with flying colors on the pavement of success. Incorporated in 2013, the company has faced numerous ups and downs but never compromised with its succession and values. The exceptional vision of its founding members laid a marvelous and prudential foundation that was carried successfully by an outstanding people who contributed with the all their heart in the progress Fluper has achieved today. Being a leading mobile app development company, it’s important for us to mention the respect and acknowledgement that we have got from the global business giants and other important entities of the world. Recognized by NASSCOM as its member, we further got an opportunity to grow and decorate ourselves with Global Tech Giant IBM as their Platinum Business Partner which was an honor for us. Apart from that we have got nominations in different IT Award Functions all around the world from Dubai to Tunisia as the Best IT Start Up in 2016. Motivated with such an astounding progress and fame, our founders decided to transform and expand their scope of work. Responding to which, they decided to get a new development base at Noida that is architecture and crafted very uniquely with a state of art approach providing a space to grow and nurture your skill with smoothness. Open space that leads to the complete transparency has brought an edge to its moto of bringing fluidity in the performance. Our fluid performers comprises of the young and dynamic blood who have hunger to learn, earn and grow together. Our fluid performers are vibrant and dynamic in every walk of life from development to sales, every department is fuel of zeal and momentum that drives us to create an exceptional milestone. Sticking to our values and matching up the pace of time and technology is what makes us stand out of the crowd and we have proved this aspect numerous times while bagging the top ranks in our arenas. With the cordial gratitude to you for your priceless contribution in our success, we bid you good bye with the memories we celebrated in journey of half-a-year.